Mr What returns in Triumph to his stables in Rathcoole! The great racehorse, MR WHAT, was bred by Mrs Barbara O'Neill of Rathganny, Co.Westmeath, Ireland and was born in 1950. His Sire was GRAND EXECUTIONER and his Dam was DUCHESS OF PEDULAS. In 1958 and 1959 he was owned by Mr David Joseph Coughlan who had bought him from his trainer Mr Tom Taaffe, who trained in Rathcoole, Kildare and continued to train him. Tom and his son Pat, aka 'Toss'. had already ridden for Mr Coughlan in 1955 with Carey's Cottage in the Grand National, third behind Quare Times, and ridden by Pat . Three years later Tom Taaffe achieved outright success when Mr What won the Grand National in the colours of Mr Coughlan. Unfortunately for 'Toss', his commitments prevented him taking the mount. Under the terms of his retainer from Vincent O’Brien, ‘Toss’ was committed to a Ballydoyle entrant and thus could not ride Mr What, trained by his father. They had teamed up to win the Troytown Chase at the beginning of that season. With a week to go to the big day, Tom Taaffe engaged English jockey Arthur Freeman, who was the Queen Mother's jockey at the time. No sooner had he done so than Vincent’s intended runner met with a mishap and was taken out of the National. ‘Toss’ took a chance mount on Brookling. They came to grief, as Mr What and Arthur Freeman galloped to Grand National glory. Nor did Mr What make it up to 'Toss', for he never won another race, though they did finish third to Oxo in the 1959 National, and he later came 3rd again in 1962. In 1958 Mr What was an 8 year old bay gelding and it was his first attempt at the National. The going was muddy and he only took the lead three quarters into the race at the 22nd jump, the famous Bechers Brook. He held the lead from there having something of a wobble going over the 30th jump when he clipped the top and looked like he might go down, but jockey Freemen yanked him up and he made it over safely and went on to win easily 30 lengths in front of the next horse. His time was 10.01 1-5 and he was carrying the minimum 140 pounds. Second was Tiberetta, followed by Green Drill in 3rd and the favourite Wyndbrough in 4th. That years first prize winnings were the highest payout so far in the Natiional at £38,624.60 (equivalent to approx £1.5 million today) and Mr What was the 38th Irish Winner in the previous 58 Nationals. He was also the last until the great L'Escargot ( who had his half sister What a Daisy as Dam) win in 1975. Due to the bad weather, the turnout for the race was low and neither had the Royal Family attended as they had no runner in the race and there had been some critisms from humane societies that the race was cruel. Mr What apparently came by his peculiar name because nobody could think up a better one for him! His 2/3rds sister WHAT A DAISY, bred by Mrs O'Neill and also sired by GRAND EXECUTIONER, and whose Grand Dam was DUCHESS OF PEDULAS, was the Dam of the great L'ESCARGOT, again bred by Mrs O'Neil and winner of the Gold Cup at Cheltenham in 1970 & 1971. In the Grand National at Aintree he was 3rd in 1973, 2nd in 1974 and Winner in 1975, He died in 1984. However, handsome is as handsome does and proud owner David Coughlan presented the Mr What Perpetual Challenge Cup, contested each year at Tuam racecourse - of which he was a director - until that western track closed its gates on August 3, 1973. Curragh trainer Kevin Bell won the last renewal of the Mr What Cup, with Martin, owned by P. A. 'Pakie' Cummins and ridden by Michael Grassick. The cup would warrant display in the Irish Racing Archive - inching closer to reality - if anybody knows what became of it. L'ESCARGOT: 14 wins viz. 2 wins at 4 miles on the flat and placed twice; also 3 wins over hurdles inc. Gloucestershire Hurdle and 8 wins over fences inc. Cheltenham old Cup (twice), News of The World Grand National H. Stp, L., Sundew H. teeplechase, L. and W D & H O Wills Premier Final Chase and winner over umps in U.S.A. viz. 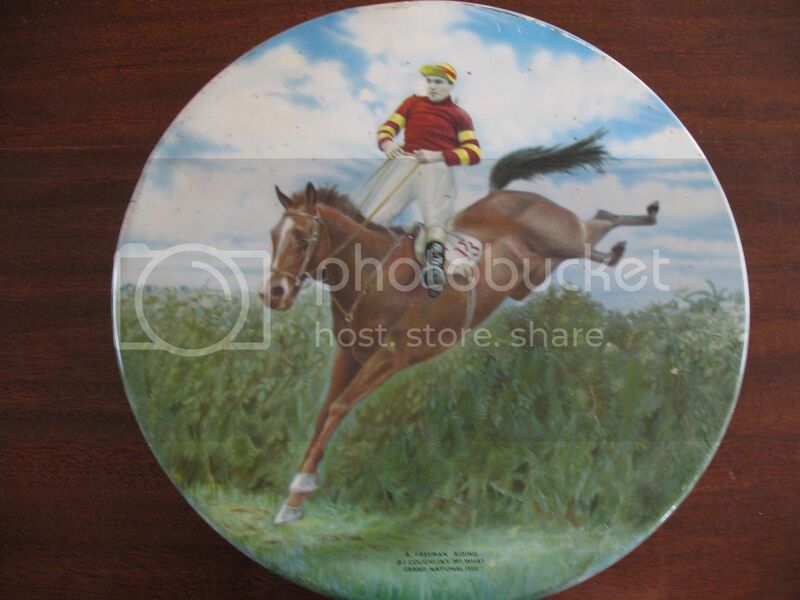 Meadow Brook H. Steeplechase. FLITGROVE: 6 wins viz. 3 wins over hurdles and 3 wins over fences inc. Scilly Isles Novices' Chase, L.; also 2 wins in point-to-points. HAVAGO: 6 wins viz. 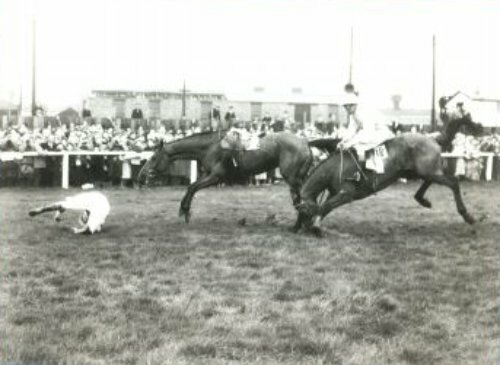 winner at 4; also 4 wins over hurdles inc.
Oxo Beats Mr What in 1959! In 1959 Michael Scudamore landed the prize on farmer Johnny Bigg's bay gelding OXO, only to be upbraided by the trainer, Willie Stephenson, for hitting the front too early. Stephenson had sent Scudamore off with the terse instruction: "Give him a chance and hit him only as a last resort." The race could hardly have gone better, with Oxo giving a near perfect ride, while the horses that might have upset him, Mr What and Wyndburgh, suffered, respectively, from the cruel hand of the handicapper and misfortune. Mr What was weighed down with 11st 9lb and his gallant effort fizzled out with two fences to go, leaving Oxo and Wyndburgh to contest the finish. These two had been in each other's company, handily placed almost throughout the race and Scudamore remembers Tim Brookshaw, Wyndburgh's jockey, calling out to him as they jumped the water near the front: "At least we'll be on the film." He was referring to Pathé's delayed newsreel footage, which was the only way to watch the National then, apart from going to the course. Mirabel Topham, Aintree's fearsome owner, was always worried that television coverage would keep the crowds away and the race was not screened live on the BBC for another 12 months. Brookshaw's next comment was more dramatic. "When we jumped Becher's for the second time, Tim shouted across to me that he'd broken his stirrup leather," Scudamore says. "I didn't answer him back, I just thought, 'That's a good thing, it'll help me a bit." He needed all the help he could get because Brookshaw's bad luck resulted in one of the most skilful pieces of riding the National has ever witnessed. Rather than pulling up, as he might have done, Brookshaw kicked his other foot free and rode the rest of the race without irons. He did this so brilliantly that, although Oxo had a big advantage clearing the last, his lead by the winning post had been whittled down to one-and-a-half lengths. "I could hear Tim and Wyndburgh behind me all the time," Scudamore says, "and although mine kept going and jumping, we hit the last very hard. It seemed a long time from the final fence to the finish."